All children have the potential to construct their own learning and are not simply empty vessels to be filled with knowledge. There is a strong connection between the home and the school, and the teachers and families work closely together to strengthen the child’s education. The school environment and curriculum are designed to foster an intrinsic love of learning. The environment encourages activity, engagement, discovery, and use of a variety of media. 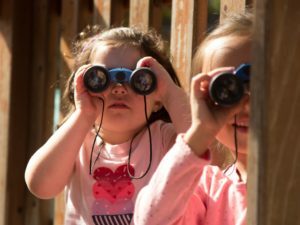 The curriculum is emergent, meaning it is child-centered, follows from the interests of the children, and allows them to return again and again to a project to add new insights. The teachers collaborate daily to engage the children in long-term projects based on the their interests. The projects are carefully documented by the teachers through observation and recording. This documentation provides a window into each child’s learning and highlights the value of the thought processes and work. Time is not solely dictated by the clock. The teachers respect each child’s pace and time table. The teachers are with the children for two years, so the teachers know each child very well and the children have the opportunity to develop and maintain a secure, consistent attachment through which they can thrive. 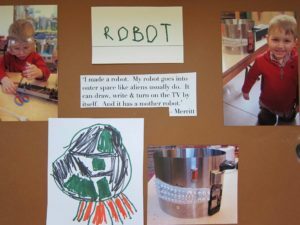 An emphasis of the Reggio Emilia philosophy is the documentation of each child’s progress through photos, videos and the written word. The school’s walls feature rotating displays of the children’s unique artwork as well as their comments. At the end of the school year, each family receives a binder filled with their preschooler’s artwork, photos and narrations.